A submarine wreck found off Sweden is probably a Russian vessel from World War One, the Swedish military says. There had been speculation that the remains were much more recent - those of a suspected Russian vessel, spotted near Stockholm last year. The Swedish Armed Forces examined footage filmed by divers from the Ocean X team who found the remains. In a statement (in Swedish) the military said the wreckage was probably a Russian submarine that sank in 1916. 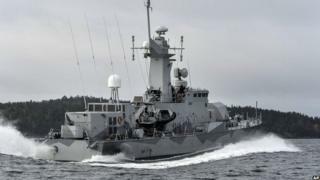 Last October saw Swedish naval vessels and military planes carrying out an extensive search operation after sightings of what was alleged to be a present-day Russian submarine. The operation was called off after one week and Russia's defence ministry always denied any of its ships were involved. Russia's annexation of the Crimea peninsula and Moscow's continuing support for separatist rebels in Ukraine have fuelled suspicion about its intentions towards other neighbouring states, notably in the Baltic. The wreck of what is thought to be a World War One vessel was discovered by Ocean X Team and Ixplorer last week. The company said the vessel was about 20m (66ft) long and 3.5m wide and was "completely intact", with its hatches closed. Military spokesman Jesper Tengroth told the Local newspaper that the video material suggested it was a Russian "Som" submarine "which sank after it collided with a Swedish submarine in 1916". They said it was no longer a matter for the armed forces and had been reported to the government. Dennis Asberg, a partner in Ocean X Team, told Reuters that they planned to re-examine the vessel to confirm its origins. "I am 99.9% sure it's from 1916, but the next step is to go down again and confirm it," he added. What was lurking in Sweden's waters?